Amsterdam has more than one hundred kilometers of canals in Amsterdam, about 90 islands and 1500 bridges. The four main canals Herengracht, Prinsengracht, and Keizersgracht, en Singel form a concentric belt around the old city, known as the grachtengordel. Alongside the main canals are 1550 monumental buildings located from the 17th and 18th centuries. The famous Amsterdam canal system dates from the 17th century, which, due to the cultural, economic and political prosperity, was also called the golden age. With immigration at a height, a shortage of houses and lack of space was created. It forced the City Governement to a comprehensive plan that would make the city five times as big. With the plan, in which utility and beauty were combined, a cautious start was made at the end of the 16th century. The large expansion followed in 1613 when, among other things, the Herengracht, Prinsengracht en Keizersgracht canals were dug. A new neighbourhood at the west of the canals was developed, the Jordaan. The three canals were given an exclusive residential function, they were ‘urban palaces’ of wealthy merchants bankers, administrators of the city and other wealthy people of Amsterdam. The group over the years has expanded with numurous shops and The Spiegelkwartier. The museums exhibit living in Amsterdam from the golden age to the present day. With a ride on a classic saloon boat or with the Canal Bus, the city can be admired from the water. Go for dinner at one of the canal restaurants or book a night in a historical canal house hotel for a complete canal experience. Nowadays the Canal District area forms the vibrant heart of Amsterdam with its shops, restaurants, hotels, museums, theaters and cinemas. The combination of preservation and renewal of four centuries of rich history has made the Amsterdam Canal belt to dynamic heritage of world format. In 2010 the canal ring was recently placed on UNESCO’s World Heritage list. The Singel encircled the city in the Middle Ages. 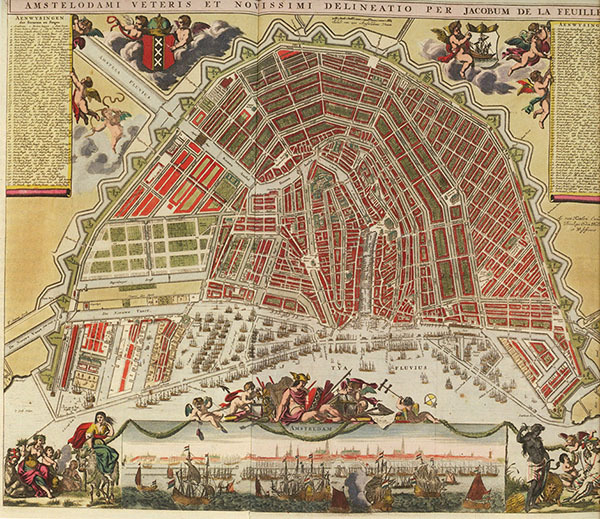 It served as a moat around the city from 1480 until 1585, when Amsterdam expanded beyond the Singel. The canal runs from the IJ bay, behind the Central Station, to the Muntplein square, where it meets the Amstel river. It is now the inner-most canal in Amsterdam’s semicircular ring of canals. The Herengracht (Gentleman’s Canal) is is the first and the most elegant of the three major canals in the city centre of Amsterdam. The most fashionable part is called the Golden Bend, with many double wide mansions, inner gardens and coach houses on the Keizersgracht. The Keizersgracht (Emperor’s Canal) is the second and the widest of the three major canals in the city centre of Amsterdam, in between the Herengracht and the Prinsengracht. It is named after Maximilian I, Holy Roman Emperor. The Prinsengracht (Prince’s Canal) is the fourth and the longest of the main canals in Amsterdam. Most of the canal houses along it were built during the Dutch Golden Age of the United Provinces.